This is the second concept phone that bears the name of “Butterfly”, but what’s surprising about it is the age of its designer, a 15-year-old Korean student named Andrew Kim. This is rather a social networking device, more than a phone and it’s designed to be appealing for the teen audience. 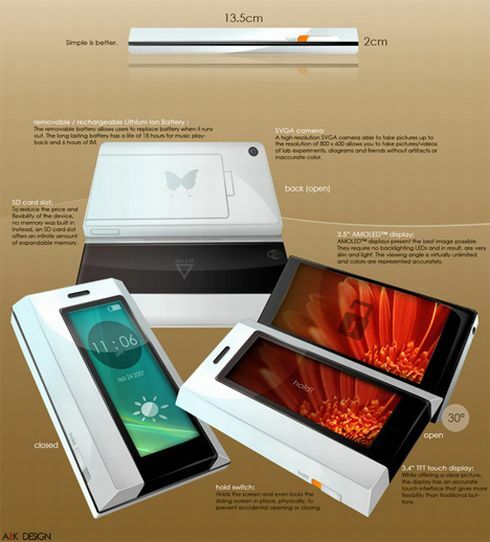 Butterfly is a slider, but a horizontal one that features a 3.5 inch AMOLED touchscreen, a camera, an SD card slot and GSM, WiFi connectivity. Also, this concept phone is germ-free, because it’s covered with silver nanoparticles that keep it clean. Andrew Kim’s brilliant social networking device will allow its users to surf the web, share media, use instant messaging services and play media content. Gaming Kids Phone Concept, Too Many Keys! 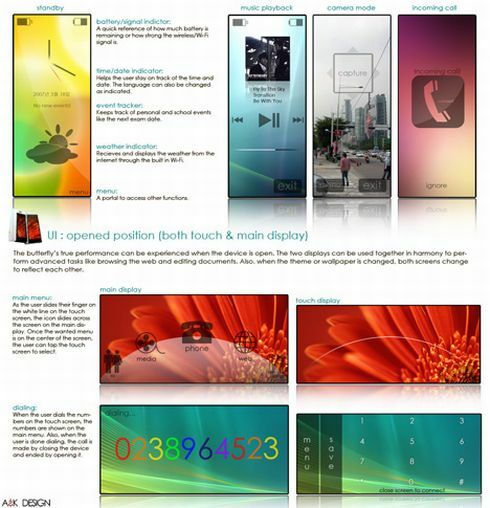 Yet Another XPERIA Concept… What a “P”!